Tomorrow I leave for Dublin to attend RecSys2012. 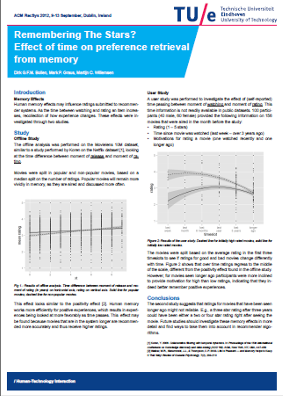 Together with Dirk Bollen and Martijn Willemsen I performed a study on how memory effects influence the ratings people will give. The main finding is that as time passes between watching and rating, people tend to give less extreme ratings. Presumably this is because people forget the details on how or why they liked or disliked the movie. Using our psychological background we were able to predict that submitted ratings would change over time. The next step is researching these effects more in-depth and using it to better model user preferences. The poster that I will be presenting is below. A link to the proceedings will be added when they are published.